Are they building a bigger mall or what? Heck of a pile of excavated material in the back ground. ???? It's a CANYON ... a deep gash in the earth. The campground is at the bottom of the canyon. The canyon walls reveal geological marvels. Growing up, my brother and I spent many days hiking the canyon with our dad. We found fossils of all kinds, as well as arrowheads and spear points of Alibates flint. The outdoor musical drama, "Texas! ", that is produced every summer, is definitely worth the trip to see. The stage is set against a backdrop of the canyon wall. Some of the special effects are absolutely amazing. Actors and singers come from around the country to perform in the production. If you get a chance to see it, DO. You won't regret it. I have some photos that I took several years ago when we took my younger son and his wife to the canyon and rented one of the cabins on the canyon rim. The views from the cabin were amazing. I'll go back on my other 'puter and pull some of those photos off and put them up here. The Palo Duro is a very special place to me. I explored fingers of the canyon with my dad and brother every summer. 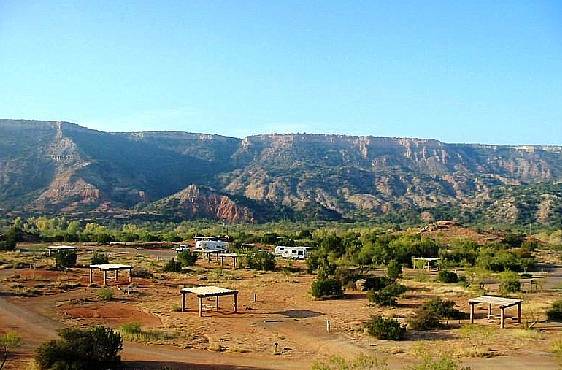 We camped many nights on the canyon floor, played in the creek, watched herds of aoudad sheep through binoculars, caught Texas horned lizards, and picked wild plums in the summer. The canyon is home to a host of wildlife, including wild turkey, bobcat, coyote, dove, quail, woodpeckers, white tail and mule deer, roadrunners, and a portion of the official herd of Texas longhorn cattle. The Palo Duro is a true gem in the southwestern U.S.
Mel & Kate and Zorro, our dashing little Havanese dog. They're shelters over the picnic tables. Mel, it looks magical. I look forward to a few pics! Maybe a place to meet up one fine day (week). Agreed! And the horned toad is or already has gone the way of the wolly mammoth that once walked the Palo Duro.... glad the wolly isn't there to crush me... but the rib shacks back then must have been awesome. My BIL has the Texas License Plate the horned toad on it. I miss those those little guys (horned toads). Lay em in your hand upside and rub their tummy - they went right to sleep. Never had one spit blood from his eyes at me... lol. I believe RVM# order is the proper way. I don't play, so I can't win, but I have "The Kimono". In the near future, we (the 3 of us) will have a Midi-C with Sue and Martin (Suspinz) and Carl (Bokobird) further south from our present location. Looks like a lunch date in Punta Gorda. BTW, our strawberry shortcakes and strawberry milkshake were excellent. Dang, I missed the opportunity to do that with Barb. I bet it was good! I'm hoping to return before March, but that isn't entirely in my control…will find out next week. I was talking today to someone and I think if I won, whoever showed up at GC 1.2, I'd pull an Oprah on them - YOU get a MILLION and YOU get a MILLION and YOU…. Can't make the GC@CL this year (w**k, darnit) but am going to Decatur in June for the Fleetwood gathering. Sorry, old MAC is staying in the family. Son has it. Another graduate of Waynes School of MH Driving. Wondering if curb feelers woulda helped. You won't have a problem with flooding over river crossings very often ... we only get around 20" of rain a year out here. But when that rain does come - Palo Duro gets wet and muddy. We were then when a little of that rain fell. Yessirree, Captain, it would be a beautiful place to meet up. Here are some pics (all taken by me) from a few years back when we took my son & dil to the Palo Duro. Spent 3 glorious days there. First photo: Son Andrew and dil Brittany at an overlook. Will be there again in April with my mom and sister for a mother-daughter campout to celebrate mom's 87th BD. Talk about a mutant! My mom is AMAZING! Will be sure and post pics from that outing! Here are some pics from a few years back when we took my son & dil to the Palo Duro. Spent 3 glorious days there. Thanks Mel we've been looking at Palo Duro and may stop there on our way out to the GC II at where ever and when ever it is! You can mark that on your calendar!